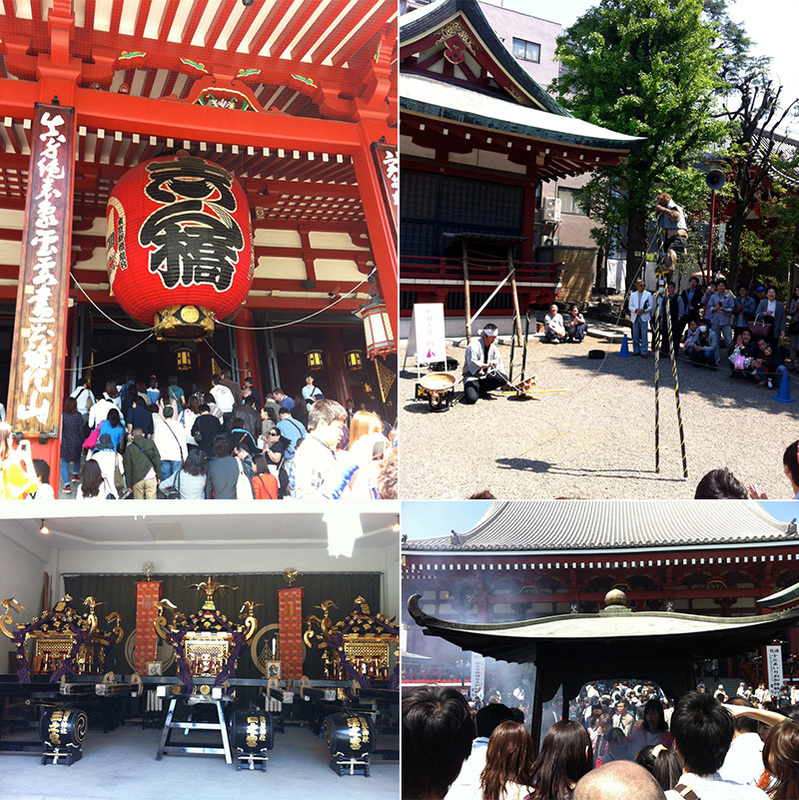 During “Japanese Golden Week,” long-term holidays, many people visit Senso Temple. You may purchase a bag of smoke from an incense burner, which we say that you will be clever if you let your head be enveloped with. 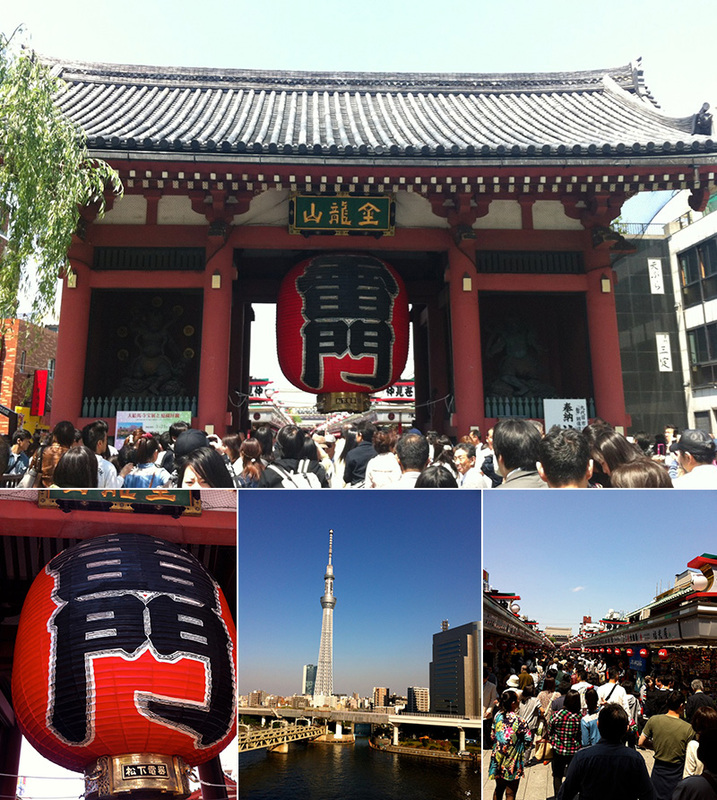 Via Senso Temple from the Asakusa Stn., you can reach the Asakusa Public Hall. In front of the hall, there is a section called “Star’s Square.” Here, you will see handprints and autographs of actors and entertainers related to Asakusa. There are 291 handprints! Our artistic director Tamasaburo Bando’s one is there, too. Please come to check it over at the venue! From June 6 to 9, we will have 4 performances in Asakusa Public Hall after 30 years' break. 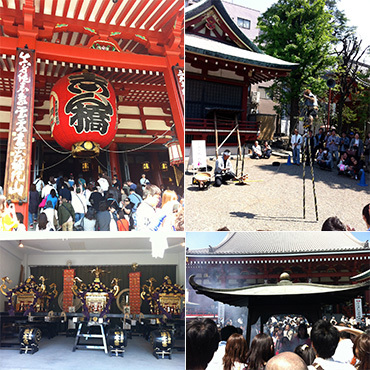 This time, we prepare a lot of special tour plans for you to enjoy Asakusa. We have put together special coupons for meals in Asakusa or visits to Tokyo Skytree. Please do not miss this special occasion! The new company office building of newspaper Niigata Nippo, "Media Ship," has opened in the Bandai Area of Niigata City. This building was designed using the shape of "Kitamaebune" or northern-bound ships (which once flourished in the Japan sea, carrying people, goods and culture from port to port in Edo-period Japan) and has very unique curved lines. 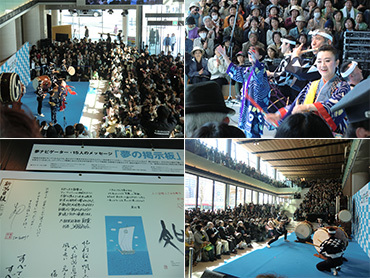 We gave a special, lively performance at its opening event "Shukkosai" to celebrate the building's "maiden voyage," surrounded by 700 to 800 audience. Niigata Nippo Media Ship "Shukkosai"
Excitement of Matsurine has never cooled down and we have talked a lot about it ever since in our usual Kodo life, especially when we drink. Matsurine has become an unforgettable performance for us. The more days that passed, the stronger we wanted to perform that concert again. So, we are very happy to get a chance to perform it again. I am very excited to create this festival with my friends. 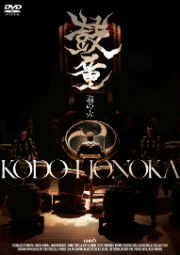 Please come along and experience our power-packed taiko performance. Kazuhiro Tsumura, Mr. Akio Tsumura’s eldest son, was one of my own fellow apprentices who I spent 2 years with at the Kodo Apprentice Centre. 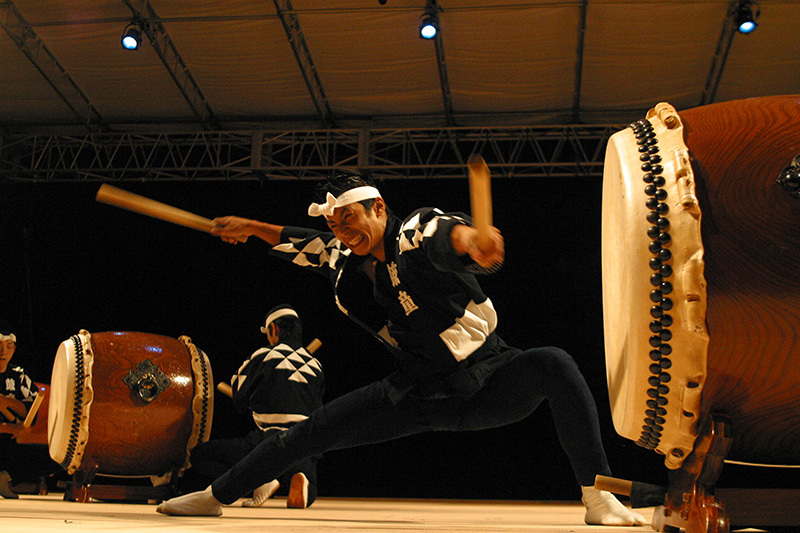 I was very glad to play taiko with him again. After that concert, I received a letter from Kazuhiro. In that letter, he wrote his thoughts about the Matsurine performance and the word “doshi” which means a comrade, as in his “fellow taiko player.” It made me so happy. We hadn’t played taiko together for some time, and Kazuhiro’s taiko had become more powerful and it had the strong air of a “Miyake man.” He impressed me and led me to reconsider what taiko is for me. I feel grateful to play taiko with him as a comrade. 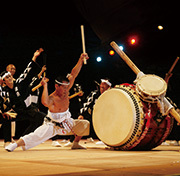 I was blown away when I felt the taiko performance of Mr. Akio Tsumura and the members of Doshikai at Matsurine firsthand. At the same time, I was surprised that they were able to create a performance for an hour and a half with the rhythm of Miyake and the audience was enlivened as if they were at the actual festival. We usually perform for 1.5 to 2 hours by playing several pieces, but they were able to move the audience with just their Miyake rhythm. 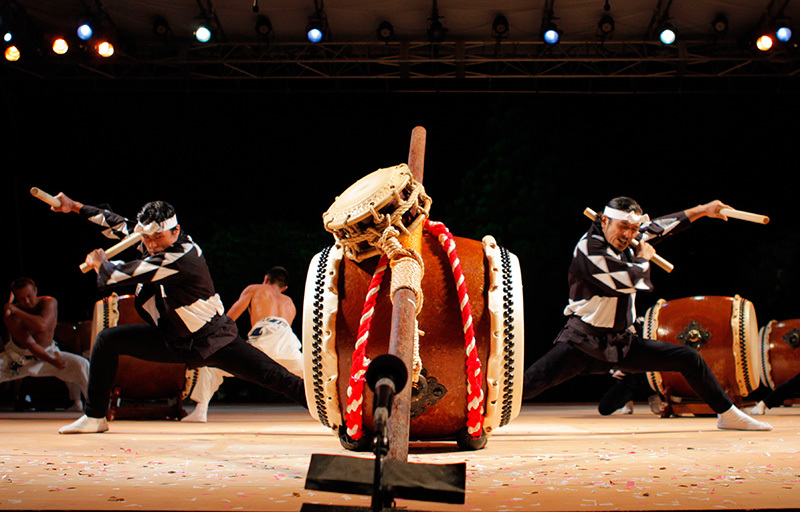 Each sound they made fulfilled my ideals of what taiko is. I felt “This is real taiko!” I was very lucky to join them for this performance and other Kodo members surely got something special from the experience, too. It was a legendary concert. 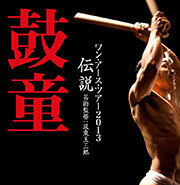 On May 20, Kodo members will make a guest appearance in “Matsurine 2013” featuring Miyakejima Geino Doshikai. Kenta, who will perform in this concert, would like to share his thoughts about this performance with you all. Please come along for a power-packed performance by both groups! “Miyake” is one of Kodo’s well-known pieces and Mr. Akio Tsumura, the leader of Miyakejima Geino Doshikai, has been teaching us this traditional taiko style from the festival of Miyake Island and supporting us for almost 30 years. 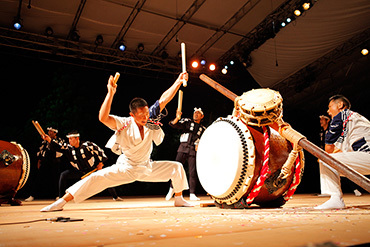 The first Matsurine was held in 2011 to commemorate Mr. Tsumura’s 60th birthday and he invited Kodo members to perform with him. In a way, this experience was very shocking to me. Recently I went to Hidakagawa in Wakayama for "Cherry Blossoms, Dance, Dojoji" at Dojoji Temple. 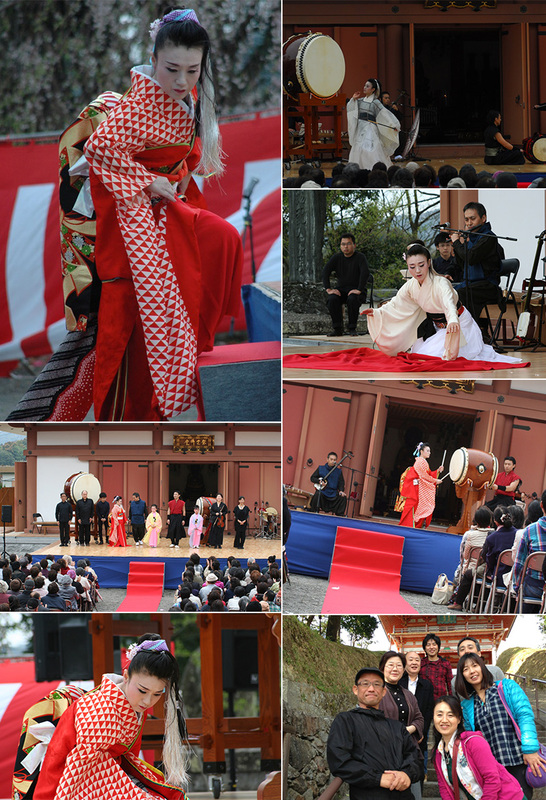 My Yukiai performance was held at this temple: a holy place for performing arts and the theme of the legendary story of Anchin and Kiyohime. I danced my heart out as “Kiyohime.” Cherry blossoms petals were sometimes blown around by the wind, which became a wonderful stage effect. This performance encapsulated my tenacity for the stage. Kodo Website "Kiyohime" at "Cherry Blossoms, Dance, Dojoji"